Another old soldier who never speaks. the tale worth telling from this safe distance. to safety through a Belgian quagmire. at any time. Simply had to do it and get on. Great poem, I felt I was there with the solider, and understood what he was thinking, a very good choice of the photo as well. Thank you very much, Mags – my very best wishes to you. Outstanding poem in how totally it captures the experience of carrying a mortally wounded soldier out of the battle lines–and doing so in relatively few lines! The photo also facilitates your message here quite effectively. Yes, I thank you so much Granbee – I used to know someone (years ago) who fought in the ‘Great War’ and this is how he looked, blue eyes full of colour but his soul looked dead, somehow. Little wonder perhaps, considering the nightmares many of them went through and never forgot. I’m grateful to you. As always… A splendid piece of work. Id like to extend an invite to you to be a guest poetry blogger on my blog/website. Love your poetry! I have people in my family serving in Army i know what it does ..and you have told the tale so beautifully..
Amazing. The thing about poetry, one never ever sees a typo in poetry. The words are to sparse, to carefully assembled for silly errors to slip in. David, you brought this scene to life – I could see it so vividly, the man’s face and demeanor. War does such horrid things…. This is a fantastic poem David, so real in it’s feel. We found medals in a bric-a- brac drawer after my dad died and even found out that my grandad had been awarded an OBE! 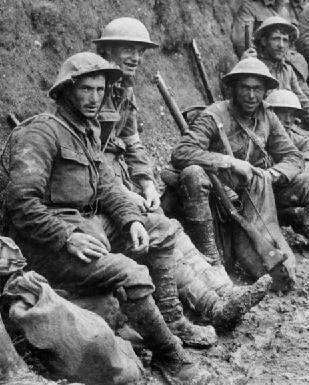 They all (from the first and second wars) kept their bravery so quiet, it’s very humbling to know that I think. Terrific. You really captured what was going on beneath the stoic faces .I think people in general of that era were expected to be stoic, soldiers especially so. My Granfather fought in the Great War and came home wounded.. and I remember as a small girl seeing his medals.. but he would never speak about it.. No wonder when you know the horrors war inflicts..
Hey David, war poetry and poetry on soldiers has a special place in my heart, so I love this. I’m especially fascinated by WWI and the men who served and made it through. It’s miraculous really that anyone did, it seems. Excellent portrait you’ve constructed here of the effects of war on the individual. Sad and somewhat haunting. You’ve really captured the difficultly of continuing the journey through life after enduring such an ordeal…medals left in bric-a-brac drawers…says so much. Thank you so much! I would be honoured! Soma, thank you, I always appreciate your comments, I am very grateful. I’ve been out today, so I’m trying to catch up! Thank you so much, once again. I really do appreciate it. Betty, thank you once again. It means a lot when you comment on my poems as you are such a fine poet! Thank you Christine, I really appreciate it. An OBE? Good heavens, there must be so many untold stories. Susan, I thank you! I really appreciate your comments. Debra, you are so kind and I thank you! Yes, with the centenary coming up, it is now a time for us all to reflect on what this war meant. Disaster and tragedy are understatements. I share your interest, I hope your studies go well. Thank you! Sue, I thank you! You are very kind. Yes, that war still casts strong ripples through our lives. Thank you! Emma, thank you so much! I always appreciate your comments as you write some wonderful poems. Yes, this poem is mainly based on a true story about my wife’s grandfather.